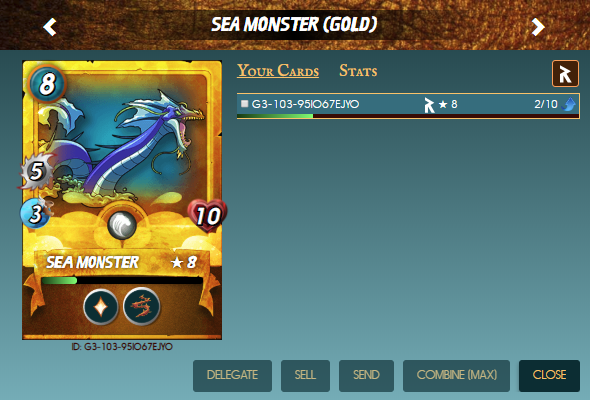 I continue to make my deck steemmonsters the best. I discovered www.share2steem.com, which allows you to integrate publications from various social networks and publications on STEEM. Я открыл для себя www.share2steem.com, который позволяет обьеденить публикации с различных социальных сетей и публикации на STEEM. Support the team of creators of @steemmonsters!!! Vote for @aggroed and @yabapmatt as witnesses - https://steemit.com/~witnesses. Every vote counts, don't be indifferent. I love this card. It's my go-to card in water splinter matches as it makes a great tank. Thanks for the comment and for visiting my blog. After approximatively 48 hours, your post has 3.746 of pending rewards.